Piracy - During the centuries of the Venetian and Turkish occupation there was a strong fear of pirates. This is the reason that lead to the "Goulades" (castles). 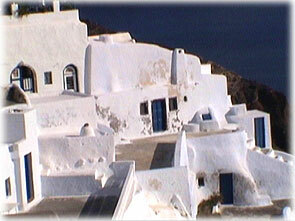 There were 6 castles in Santorini, Oia in Imerovigli, Fira, Pyrgos, Emporio and Akrotiri and a road network of "Kalderimia", roads curved into the land, deep engough for a rider on horse to travel from one castle to another without being seen from far away. Also this is the reason that several villages where built at river banks (like Karterados), in order also not to be visible and none at the sea level. Finally the roofs of several villages (like Pyrgos) are connected and one can find a way from roof to roof to the castle. Climate - The high summer temperatures and the strong wind forced the wise to built there where they were protected from the North wind and the sun. White small houses and small pathways suitable for walking and riding. 2. Aspa - the layer of Theran soil from the big minoan eruption of the volcano that has unbelievable antiseismic behaviour and lead to the use of "Yposkafa", the famous cave houses of Santorini.